Family, Food, Bikes, Linux and Fun. CoffeeNCookies, originally uploaded by chris.sussmann. In England, they call it Tea and Biscuits. ‘Round these here parts we call it Coffee and Cookies. Our holiday baking has begun. From left to right, chocolate cookies with caramel drops, chocolate chip cookies and dark chocolate cookies with Andes candies. I have a cookbook by Dom DeLuise, Eat This… It’ll Make You Feel Better! In it he gives great stories about his mother’s Italian home cooking and other favorites of his family and friends. I received this book, I think, as a wedding gift from my sister. It has lots of wonderful recipes but the one we come back to time and time again is for his mom’s meatballs. 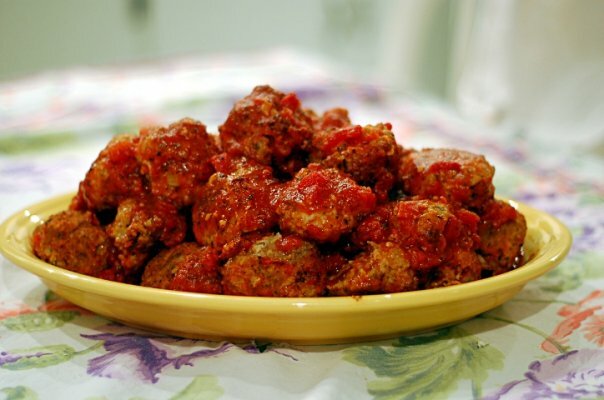 They are the traditional Sunday Meal meatball. My family asks for these frequently and we have even given them as a gift during the holidays.